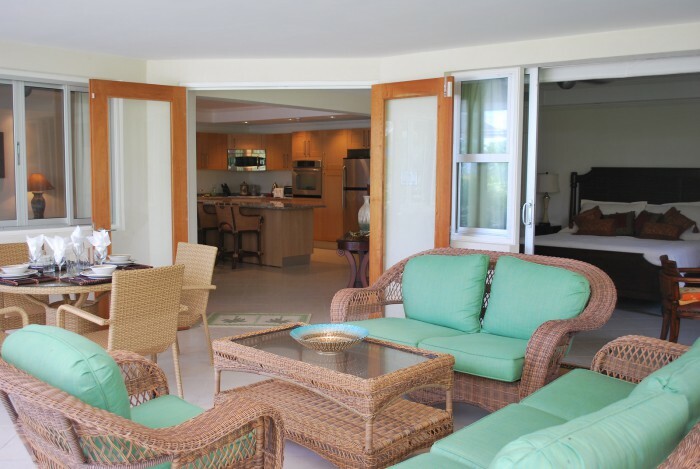 Palm Beach Condos 101 sits right next to the beach and offers beautiful views of the landscaped gardens as well as views of the sea through the shrubs which also offers privacy. This unit has a lovely walkway through the lush tropical gardens onto the communal swimming pool, and the short and convenient walking distance makes this unit ideal for quick access. As you enter the apartment, you will notice that the hallway is decorated with lovely old photos of Barbados. Two bedrooms are on either side of the hallway. From there you walk into the open plan kitchen and living room, with the master bedroom to the right of this room. The first bedroom has two twin beds and an en-suite bathroom. The second bedroom has a full size bed and en suite bathroom and the Master suite features a king size bed and a large sitting area with a lovely writing desk and a walk in closet. The room has been decorated in calming blues, greens and neutral tones and there is a view of the sea while lying in the master bed. The en-suite master bathroom features double-vanity with granite counter top and a shower as well as a tub for long soaks after a hard day on the beach. The patio is accessed either from the living room via wood framed double glass doors or from the master suite via glass sliding doors. Here is where you can relax on the comfortable chairs and loungers listening to the waves, and also have your meals. Palm Beach provides a maid service 3 half days a week. Conveniently located on the South Coast, Palm Beach is just 5 minutes outside of Bridgetown and is walking distance or a short drive to the many shops, bars, restaurants and activities along the coast. 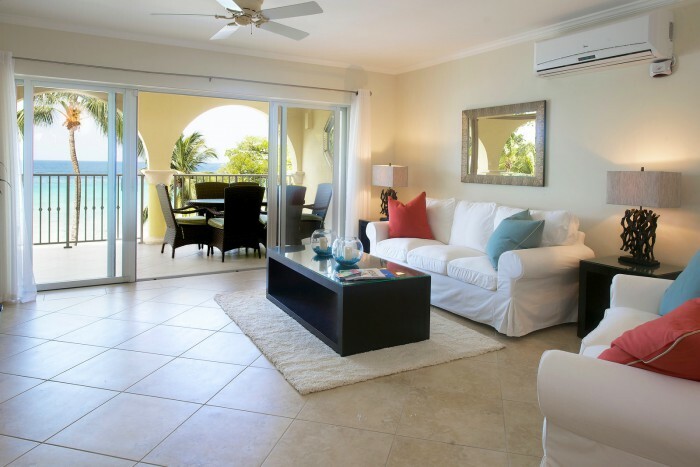 We can also offer you Palm Beach 110, which is another ground floor 3 bedroom condo. Sapphire Beach Condos is a gated beach front complex on the beautiful Dover Beach. The property features two swimming pools and a gym and is walking distance to many restaurants and the nightlife of St Lawrence Gap. #313 is a third floor three fully air-conditioned condo with lovely sea views.